Barbie Cake -4KgsLittle girls adore Barbie Dolls; when it comes to gifts, Barbie Dolls are their favorite. If you want to make your little girl’s birthday the best ever, why not order a Barbie Doll cake. 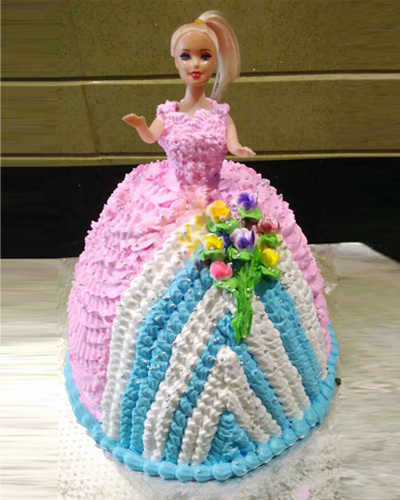 Our Barbie Doll cake makes birthday parties memorable so send cake online and add fun and excitement to the little girl’s birthday. Our Barbie Cake weighs four kg and looks exactly like the dainty Barbie Dolls and is available in five different flavors; pineapple, vanilla, chocolate, butterscotch and strawberry. We offer home delivery service and if you are planning a surprise, we make midnight delivery too.